June 25, 1950, the North Koreans, at the instigation of Stalin, invaded South Korea. The US, under UN auspices, intervened under General Douglas MacArthur. In a brilliant campaign, MacArthur led the American and allied forces to victory, largely destroying the North Korean Army and conquering most of North Korea. Massive Chinese intervention led to a see-saw war up and down the Korean peninsula, with a stalemate ensuing from July 1951-July 1953. Eisenhower got the North Koreans and their Chinese and Soviet backers to finally agree to a truce by threatening to use nuclear weapons in Korea. Our POWs during the war were treated with the usual barbarity with which Communist regimes have treated prisoners of war. One reason that the war dragged on is because many North Korean and Chinese prisoners of war did not want to be repatriated. Harry Truman, to his everlasting credit, refused to send them back against their will: “We will not buy an armistice by turning over human beings for slaughter or slavery“. Eventually, in a stunning rebuke to Communism, some 46,000 North Korean and Chinese soldiers refused repatriation. Conversely, only 22 Americans and 1 Brit refused repatriation, with almost all of them eventually returning after the war. The Korean War was one of the deadliest conflicts fought by the US: 33,746 dead and 103, 284 wounded, with the vast majority of the casualties sustained in the first year of the war. It was also a frustrating war, as the film clip from the movie Pork Chop Hill well illustrates. That film is perhaps the best depiction of the surreal quality of the war, as the US and its allies fought against the Orwellian regimes of North Korea and China, with the Soviet Union hovering in the background. My uncle Ralph McClarey fought in that war as an Army infantryman. I have written about him here. Ralph has always had an excellent sense of humor, his Donald Duck imitation would make an ox roar with laughter, and his sense of humor and his rosary sustained him through some bitter fighting. Here’s to you uncle Ralph, and to the men you served with! In a tough, bitter and often thankless war, you stopped Communist aggression and saved tens of millions of human beings from living under one of the worst tyrannies ever devised by fallen Man. Some people call Korea the Forgotten War. It will never be forgotten by me. Part of my ongoing effort to have people read the Declaration on the Fourth. This video demonstrates two things. First, that even Hollywood can’t foul up the Declaration when Mr. Jefferson’s words are allowed to speak for themselves. Second, that the Declaration is very much a speech, and is best understood when read aloud. In the ealier days of our Republic, a public reading of the Declaration was usually a part of the festivities on the Fourth. It is a tradition that I wish we would return to. Something for the weekend. Let’s start getting in the mood for the Fourth with a little Sousa. Stars and Stripes Forever performed by Vladimir Horowitz in 1945. A good video on the famous John Trumbull painting of the Declaration. Here is an absolutely hilarious scene from the John Adams miniseries in which the elderly John Adams, ever the curmudgeon, critiques the paintings on the grounds of historical inaccuracy, and simple lack of artistic merit. “Fellow-citizens, we cannot escape history. We of this Congress and this administration, will be remembered in spite of ourselves. No personal significance, or insignificance, can spare one or another of us. The fiery trial through which we pass, will light us down, in honor or dishonor, to the latest generation. We say we are for the Union. The world will not forget that we say this. We know how to save the Union. The world knows we do know how to save it. We — even we here — hold the power, and bear the responsibility. In giving freedom to the slave, we assure freedom to the free — honorable alike in what we give, and what we preserve. We shall nobly save, or meanly lose, the last best hope of earth. Other means may succeed; this could not fail. The way is plain, peaceful, generous, just — a way which, if followed, the world will forever applaud, and God must forever bless.” Abraham Lincoln, December 1, 1862. This is a repost of a post I did on The American Catholic. I thought our readers here might find it interesting. As a liberal democracy, is the United States different in any appreciable way from other liberal democracies in the western tradition, and if so, does the thought of its founders explain this? I do not think you are going to find a nexus of social phenomena that is explained by a single cause. To the extent that intellectual genealogies influence people’s conceptions of what their interests and ideals are, the thought of that corps of politicians is important. To the extent that the social evolution of the United States has been shaped by political institutions which were informed by the thought of these men, their thought is important. Any society has its signature elements. I am not sure why it escapes you what ours are, in the political realm and outside it. We can defer for a moment the more interesting discussion of the country’s social history and historical geography and just look at aspects of the latter-day political order, as you insist. 1. The political parties have tended to manifest conflict between subcultures rather than between social strata. 2. The political parties are haphazard and decentralized in comparison with their European counterparts (France excepted). 3. Formal political institutions are likewise, with many accumulated barnacles. 4. We maintain a common law system, which is not indebted to the Code Napoleon. 5. Our constitution antedates all but a few in Europe by a century and the forms delineated therein derive from institutions of colonial government more than 150 older than that; there has been intramural political violence in the United States but also absolute continuity of local institutions for more than 400 years and continuity of continental institutions for in excess of 200 years. 6. Because our institutions are comparatively antique and because they were delineated by a single statute, aspects of political practice in Britain were retained here while being abandoned there and elsewhere. Notable is the absence of parliamentary government, something quite unusual among the fifty or so most durable constitutional systems. (I believe the United States and Costa Rica are the only examples). 7. Both in politics and society, trade and industrial unions are much weaker here, comprehending just 9% of the private sector workforce. Unions in America are now lobbies for the interests of public employees. 8. The multiplication of the functions of the state and corporatist institutions and practices have been much more restrained here. Public enterprise has tended to be limited to natural monopolies owned and operated by provincial and local governments; the federal government operates a postal service, some hydroelectric stations, and maintains a large inventory of land, but that is it. The patron saint of paradox, G. K. Chesterton, had a great gift for taking the familiar, twisting it to a new angle in his mind and producing insights that were often brilliant and always well written. On 1921 he made a lecture tour of the US. In 1922 he wrote a book, What I Saw In America, which is filled with interesting observations on the US by one of our more acute observers. Here are his reflections on Lincoln. I certainly do not endorse everything he writes, but I find all of it fascinating. It has already been remarked here that the English know a great deal about past American literature, but nothing about past American history. They do not know either, of course, as well as they know the present American advertising, which is the least important of the three. But it is worth noting once more how little they know of the history, and how illogically that little is chosen. They have heard, no doubt, of the fame and the greatness of Henry Clay. He is a cigar. But it would be unwise to cross-examine any Englishman, who may be consuming that luxury at the moment, about the Missouri Compromise or the controversies with Andrew Jackson. And just as the statesman of Kentucky is a cigar, so the state of Virginia is a cigarette. But there is perhaps one exception, or half-exception, to this simple plan. It would perhaps be an exaggeration to say that Plymouth Rock is a chicken. Any English person keeping chickens, and chiefly interested in Plymouth Rocks considered as chickens, would nevertheless have a hazy sensation of having seen the word somewhere before. He would feel subconsciously that the Plymouth Rock had not always been a chicken. Indeed, the name connotes something not only solid but antiquated; and is not therefore a very tactful name for a chicken. There would rise up before him something memorable in the haze that he calls his history; and he would see the history books of his boyhood and old engravings of men in steeple-crowned hats struggling with sea-waves or Red Indians. The whole thing would suddenly become clear to him if (by a simple reform) the chickens were called Pilgrim Fathers. Then he would remember all about it. The Pilgrim Fathers were champions of religious liberty; and they discovered America. It is true that he has also heard of a man called Christopher Columbus; but that was in connection with an egg. He has also heard of somebody known as Sir Walter Raleigh; and though his principal possession was a cloak, it is also true that he had a potato, not to mention a pipe of tobacco. Can it be possible that he brought it from Virginia, where the cigarettes come from? Gradually the memories will come back and fit themselves together for the average hen-wife who learnt history at the English elementary schools, and who has now something better to do. Even when the narrative becomes consecutive, it will not necessarily become correct. It is not strictly true to say that the Pilgrim Fathers discovered America. But it is quite as true as saying that they were champions of religious liberty. If we said that they were martyrs who would have died heroically in torments rather than tolerate any religious liberty, we should be talking something like sense about them, and telling the real truth that is their due. The whole Puritan movement, from the Solemn League and Covenant to the last stand of the last Stuarts, was a struggle _against_ religious toleration, or what they would have called religious indifference. The first religious equality on earth was established by a Catholic cavalier in Maryland. Now there is nothing in this to diminish any dignity that belongs to any real virtues and virilities in the Pilgrim Fathers; on the contrary, it is rather to the credit of their consistency and conviction. But there is no doubt that the note of their whole experiment in New England was intolerance, and even inquisition. And there is no doubt that New England was then only the newest and not the oldest of these colonial experiments. At least two Cavaliers had been in the field before any Puritans. And they had carried with them much more of the atmosphere and nature of the normal Englishman than any Puritan could possibly carry. They had established it especially in Virginia, which had been founded by a great Elizabethan and named after the great Elizabeth. Before there was any New England in the North, there was something very like Old England in the South. Relatively speaking, there is still. Whenever the anniversary of the _Mayflower_ comes round, there is a chorus of Anglo-American congratulation and comradeship, as if this at least were a matter on which all can agree. But I knew enough about America, even before I went there, to know that there are a good many people there at any rate who do not agree with it. Long ago I wrote a protest in which I asked why Englishmen had forgotten the great state of Virginia, the first in foundation and long the first in leadership; and why a few crabbed Nonconformists should have the right to erase a record that begins with Raleigh and ends with Lee, and incidentally includes Washington. The great state of Virginia was the backbone of America until it was broken in the Civil War. From Virginia came the first great Presidents and most of the Fathers of the Republic. Its adherence to the Southern side in the war made it a great war, and for a long time a doubtful war. And in the leader of the Southern armies it produced what is perhaps the one modern figure that may come to shine like St. Louis in the lost battle, or Hector dying before holy Troy. 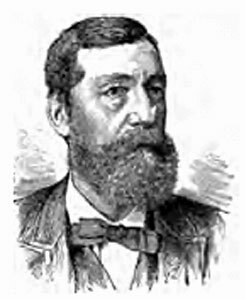 Continuing on with our series on the Governors of Illinois down to the end of Reconstruction, we come to the ninth Governor of Illinois, Augustus C. French. Born on August 2, 1808 in New Hampshire, his father died when French was a child. Eager to obtain an education, he attended Dartmouth College, but had to leave due to lack of funds. He persisted in his studies on his own, and in 1823 French was admitted to the bar. He settled initially in Albion in Edwards County in Illinois, but soon moved to Edgar Courthouse in Edgar County in Illinois. Edgar Courthouse would soon be renamed Paris, and is the hometown of the author of this blog post. French became a successful attorney, and raised his younger siblings after the death of his mother. In 1837 he was elected to the Illinois House of Representatives. Moving to Palestine in Crawford County, he became the Receiver of Public Monies for funds paid for the purchase of federal land in Illinois. Something for the weekend. A tribute to General Lee by Johnny Cash.